A native of Ooty in the Nilgiris, Tamilnadu, Professor Gonsalves studied in local schools in Ooty. After graduation from Breeks Memorial School, Ooty, he joined IIT Madras where he completed his BTech in Electronics. He continued his education in Electrical Engineering, first at Rice University in Houston where he earned his MS, and then at Stanford University for his Phd. During his PhD, he did path breaking experimental research at Stanford and Xerox PARC that established the capabilities of the then nascent Ethernet data LAN for real-time voice traffic. He began his career in teaching as an Assistant Professor in the Computer Science Department in WPI, Worcester, Massachusetts. In 1989, he joined the Department of Computer Science and Engineering, IIT Madras. He served IIT Madras for 21 years, becoming Professor and Head. He also served as Head of the PG Senapathy Centre for Computing Resources. On 15th January 2010, he took charge as the first Director of IIT Mandi. Working in the areas of Networking and Distributed Applications, he has published over 50 papers in journals and conference proceedings, and 2 chapters in books. He has guided/co-guided 4 PhD and 30+ MS theses, and 100+ MTech/BTech projects. After joining IIT-Madras, along with 2 colleagues he started the TeNeT (Telecommunications and Computer Networks) Group with its vision of "world-class technology at an affordable price". Subsequently, he was a founding Director of the IIT-Madras Rural Technology Business Incubator (RTBI). Through TeNeT and RTBI, he helped IIT alumni and others found R&D and service companies that work towards the TeNeT vision. He placed a special emphasis on developing sophisticated telecom software with small-town talent. He accomplished this by choice of location in the Nilgiris, and by guiding programmers drawn mostly from towns and villages to develop telecom software products that are in commercial use in India and many other countries around the world. Prof. Gonsalves is perhaps the first computer scientist working in academia in India to develop commercially successful products tailored to the needs of India. He was the software architect of award-winning telecom products including the corDECT WLL, DIAS, NovaSwitch and CygNet NMS. Some of these products are based on the pioneering soft-switching concept. At IIT-Madras, he has been a Principal Investigator for R&D projects worth over Rs. 7 crores, with sponsors from India and the US. He was actively involved in many other projects with a total value of more than Rs. 15 crores. He collaborates with academia and industry in India, UK, US, Sweden and Ireland. An inspiring and popular teacher, Prof. Gonsalves has taught diverse courses. These range from introduction to computing and programming for freshers, to core courses such as computer organisation, networks and operating systems, to electives including distributed systems, device drivers practicum and network management systems. 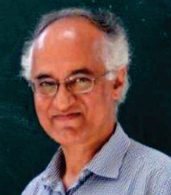 Prof. Gonsalves is a Senior Member of ACM, and a Member of IEEE and CSI.